Beetle Borers of Cane, June 1924. Meringa Station. It’s not often I get called to look at natural history or entomological collections. 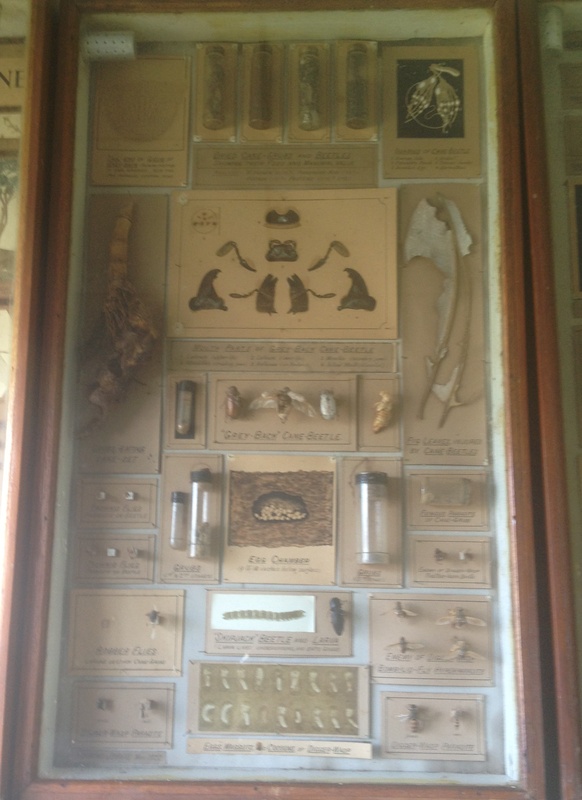 And, when I was contacted by staff at Meringa Research Station near Gordonvale to come and assess the condition of some old display cases, I must confess to being a little skeptical. 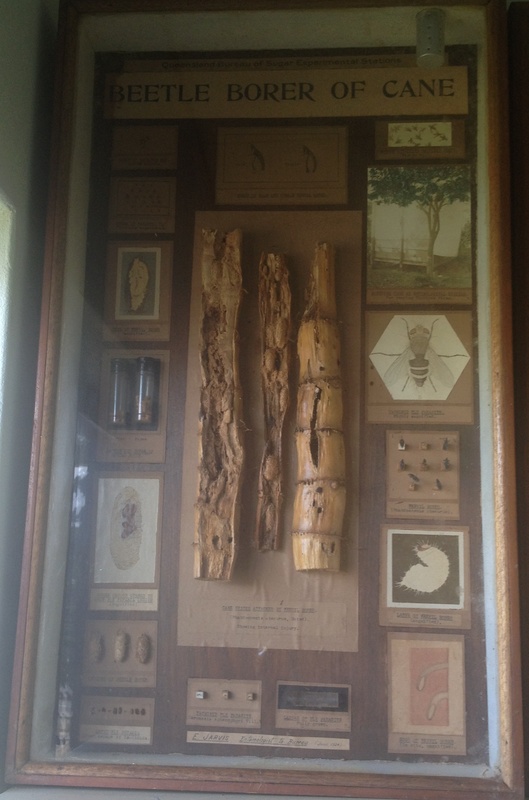 Imagine my surprise, then, when a little bit of research into their creator, Dr Edmund Jarvis, revealed that these cases were going to contain more than your average cane beetle displays. Dr Jarvis was an entomologist from the early 20th century. He ended his career as the Chief Entomologist to Queensland’s Bureau of Sugar Experiment Station, and specialised in cane beetle research. Prior to this, however, he had a museological career. After moving from Devon, England to Australia, his first job was a Acting Assistant Entomologist, National Museum, Melbourne in 1903 (now, Museum Victoria). In addition to his scientific training, he was well known for his skills in line drawings and water colours. On site, it was immediately clear that the displays had been arranged by someone with a museological eye. Seven timber framed cases, which date between 1922-1932, had been ‘curated’ to ensure that information is conveyed in an educational manner. They contain a mixture of specimens, line drawings, photographs and labels – all laid out to make the subject matter as accessible as possible. The cases illustrate the research undertaken into pests impacting the sugar industry during the 1920s by the Bureau of Sugar Experiment Stations. Bureau of Sugar Experiment Stations were, established under The Sugar Experiment Stations Act of 1900 and were initially administered by Queensland’s Department of Agriculture. Employees undertook research to assist growers and millers improve the breeding, planting, growing, harvesting and milling of sugar cane. The focus on the cane beetle, and other cane related pests, demonstrates the importance of the research stations, the work they were conducting, and of the value placed upon the cane industry in Queensland in general. In valuing these cases, I have come to think of them as more than just the work of a scientist, but as the work of a fellow museum worker with a passion for conveying information to different audiences. I am hoping to secure funds to assist with the conservation of the cases, and a way to interpret them further – in consultation with staff at Meringa. Posted on 6 May 2015, in Jo's Diary, Uncategorized and tagged Cairns, Cases, conservation, Far North Queensland;, Gordonvale, Jo, natural history, Sugar. Bookmark the permalink. 1 Comment. Have fun at Meringa Jo! At least it is on the Queensland Heritage Register now, which should help ensure that the Research Station’s buildings, as well as its historic collections of cane pests, are preserved for future generations to visit.